An internship recommendation letter is a document which is to be filled out by an individual who is recommending a student for an internship position in a company or in an organization. The form will serve as a character reference statement about the student that the sender can prove to be valuable for the internship program. Furthermore, the statements and information to be included in an internship recommendation letter would be the achievements of the student and the curricular standing of the student which is related to the internship position that the company is offering and will be needing. 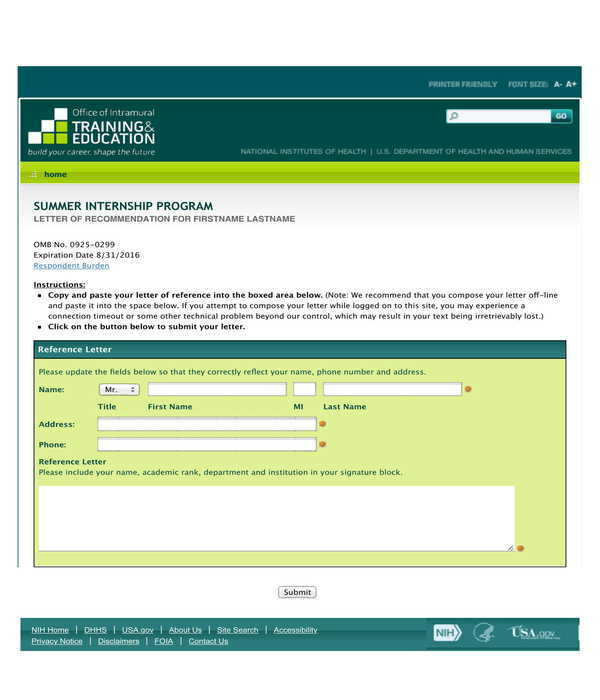 Internship Recommendation Feedback Letter – Compared to a generic internship recommendation letter, this document type contains a list of items or factors to be evaluated and scored by the recommender. The greeting and the body of the letter will be the first elements to be found in this letter type which is then followed by a section for the item list. And beside each item, the recommender’s rating will be indicated of whether the student is superior, commendable, average or below average based on the skills and observations of the recommender. In addition, this letter type will also document the overall impression of the recommender along with his comments and the explanation of his recommendation to be considered by the company who will be hiring the student as an intern or apprentice. 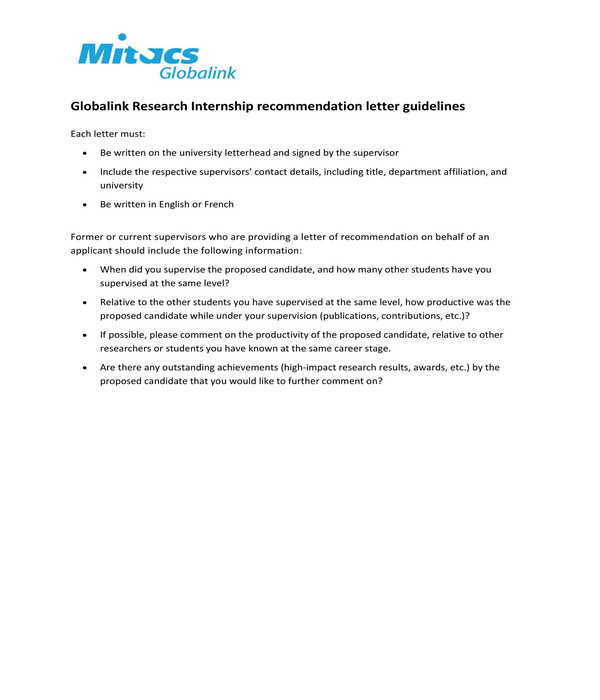 Internship Recommendation Guidelines Letter – This document type is not to be filled out by the recommender rather it is simply for informing the recommender about the do’s and don’ts as well as the steps to follow when making and submitting a recommendation letter for an intern. Specifically, in an internship recommendation guidelines letter, the recommender will be able to know about the necessity in placing the letterhead of the educational institution along with his own contact information in the letter that he will be creating. 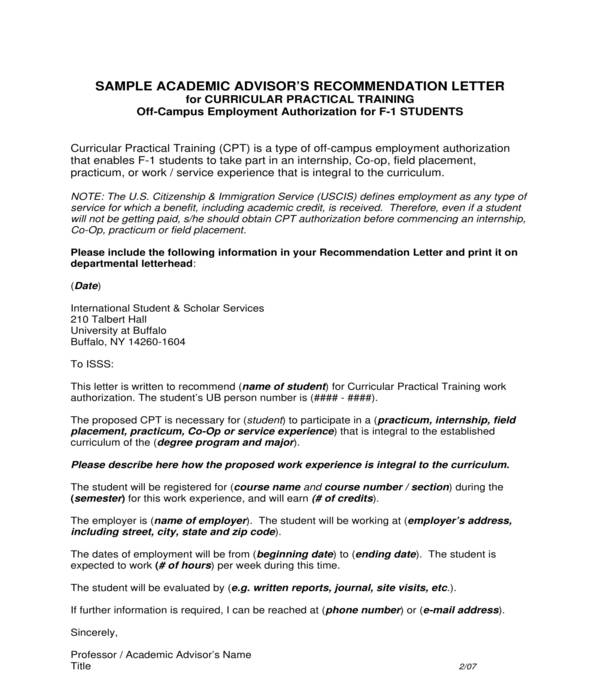 There is also a set of questions which will guide the recommender towards the factors that he must disclose in the letter in lieu of the recommendation for the student. Internship Recommendation Letter with Questions – Just like the aforementioned recommendation feedback letter, an internship recommendation letter with questions will collect the observations and evaluations of the recommender in an organized manner. However, the difference between the two is that the first letter type focuses on attributes and factors which can be scored using a rating scale while the latter should be filled out using answers with explanations. Some of the questions which are often included in this document type center on identifying the relationship of the recommender to the student as well as in determining the student’s skills and physical condition. When Are Internship Recommendation Letters Used? Internship recommendation letters are used during the internship program application period of a company or an institution. The form is one of the basic requirements to be submitted by a student who wants to be an intern along with his internship application form and resume. Moreover, an internship recommendation letter should be verified by the receiving company to ensure that the contents and disclosed information in the letter are based on facts and that the recommender is indeed real and actual personnel in the claimed institution. The verification process can easily be done by contacting the institution and the recommender after the letter had been submitted by the student. 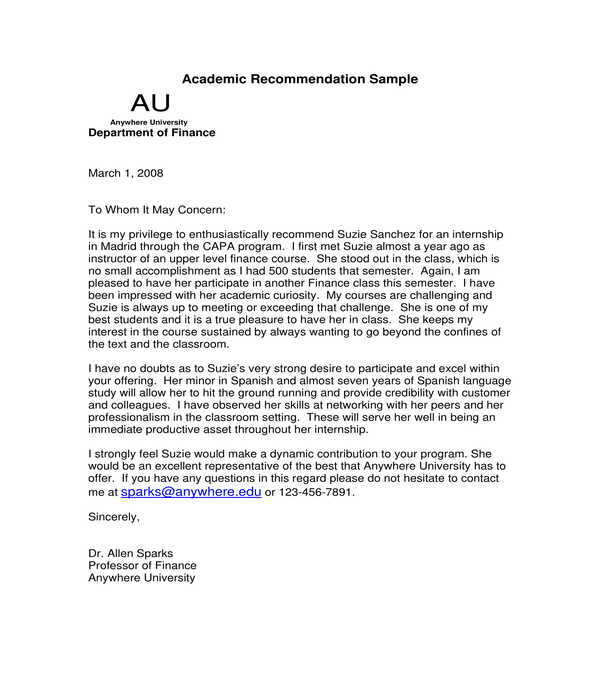 Why Consider Using Pre-Formatted Internship Recommendation Letters? Pre-formatted internship recommendation letters allow recommenders to simply fill in their own statements and evaluations about the student that they are supporting to be an intern in the targeted company. The pre-formatted letters will contain lines and boxes as placeholders for the information, data, and statements of the recommender. In addition, the letters can also be edited or be customized to ensure that its contents and even its design elements will be changed to incorporate the branding preferences of the educational institution that the intern is representing for. Make a draft first: Making an internship recommendation letter can be a tough challenge for recommenders especially if the letter is an urgent need. In order to avoid or minimize errors and erasures, the recommender must make use of a draft first before proceeding into making the actual letter to be sent to the company. 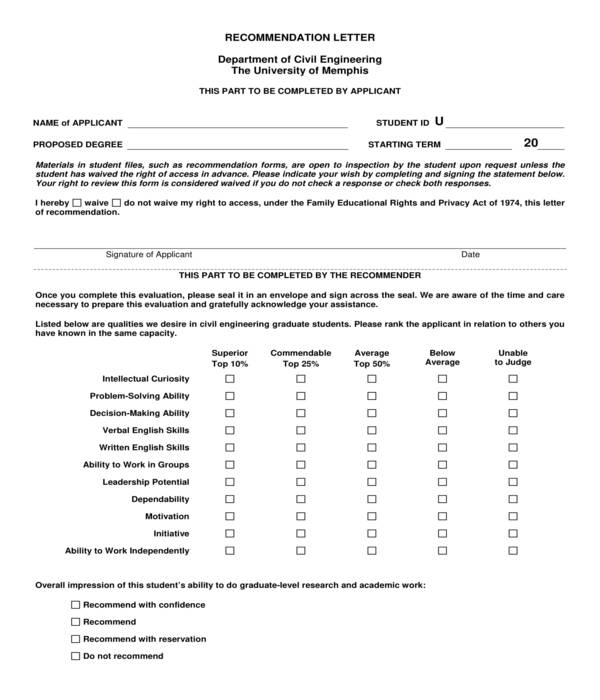 The draft should include a list of attributes and qualities that the student is exemplary at. Use a business format: Business formatted letters are organized, clean, and formal which is why it is essential that the arrangement or the layout of the internship recommendation letter should be based on the general business format. With this format, the letter will begin with the heading followed by the inside address, the greeting, the body of the letter, the complimentary closing, and the signature line. Focus on the needs of the company: Every company or organization have their own goals, objectives, needs, and preferences which should be met by any individual who plans to work either as an employee or as an intern. For this, the recommender must ensure that the statements and the contents of the recommendation letter that he will be making will state the connection of the student’s abilities to the company’s needs. This allows the company to know that the recommender is not sending the recommendation for general purposes of supporting a student but for helping the company as well in hiring and having the right people for the internship position. Most of all, the recommender should also adhere to the guidelines of the company when making and sending recommendation letters. 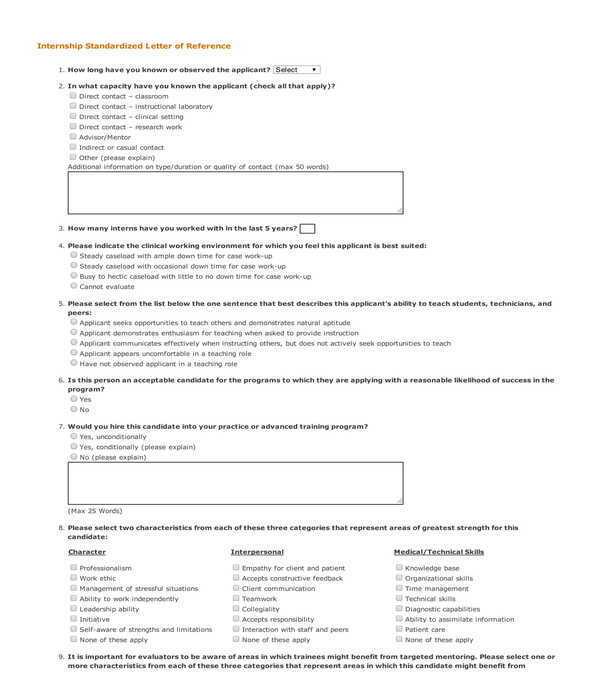 This includes enclosing the required supplemental documents to prove the claims of the recommender about the student being recommended to be an intern.